WordPress 4.9.8 will contain the “Try Gutenberg” callout, encouraging site owners to install the Gutenberg plugin, to test how their existing content and plugins works with the block editor. It also presents the option of installing the Classic Editor plugin, should they feel that they need more time to prepare for switching over to the block editor. 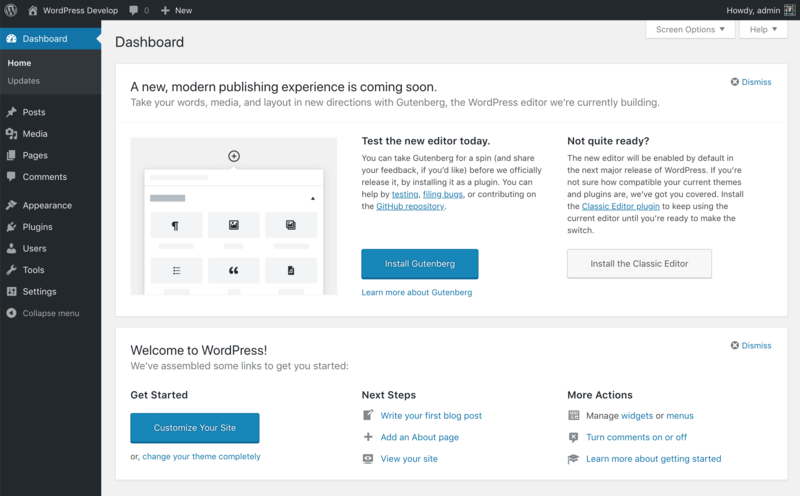 Screenshot of the “Try Gutenberg” callout in place on the Dashboard. Thanks Gary, I’ve added your code snippet to hide the callout as a plugin. I have been brave guys and tried Gutenberg but it is very far from being rolled out in my opinion and there will be a lot of issues and bad comments coming back. I hope it will not become compulsory on wordpress sites for a long time yet. I have spent all day playing with it and the the basic functionality is no where near good enough yet. Some simple tasks such as being able to link a `single image` from `inside` a block to other pages on my website is impossible though you would think it would be easy to fix. Sorry if I am posting on the wrong page but having answered the `call out` and it would have been good for those users like me to be able to find a page easily to to make developers aware of some of the issues. Having almost just completed a new website I am in fear of the new changes, I hope I can be re-assured. Backed up the site fully and bravely tried – the install seemed to fail and many edit pages just wouldn’t complete loading. Totally breaks the back end for my site, whilst the front end is unaffected.